Publick House in the Desert? Augustine, perhaps the greatest theologian in the history of Western Christianity, was born in 354 at Tagaste in North Africa. In his restless search for truth, he was attracted by Manichaeism and Neoplatonism, and was constantly engaged in an inner struggle with his personal morals. Finally, under the influence of his mother Monnica, Augustine surrendered to the Christian faith in the late summer of 386. He was baptized by Ambrose, Bishop of Milan, on Easter Eve in 387. After returning to North Africa in 391, Augustine found himself unexpectedly chosen by the people of Hippo to be a presbyter. Four years later he was chosen bishop of that city. His spiritual autobiography, The Confessions of St. Augustine, written shortly before 400 in the form of an extended prayer, is a classic of Western spirituality. Augustine wrote countless treatises, letters, and sermons. They have provided a rich source of new and fresh insights into Christian truth. The Manichaeans had attempted to solve the problem of evil by positing the existence of an independent agency eternally opposed to God. In refutation, Augustine affirmed that all creation is essentially good, having been created by God; and that evil is, properly speaking, the privation of good. A rigorist sect, the Donatists, had split from the Great Church after the persecution of Diocletian in the early fourth century. Against them, Augustine asserted that the Church was "holy," not because its members could be proved holy, but because holiness was the purpose of the Church, to which all its members are called. Stirred by Alaric the Visigoth's sack of Rome in 410, Augustine wrote his greatest work, The City of God. In it he writes: "Two cities have been formed by two loves: the earthly by love of self, even to the contempt of God, the heavenly by the love of God, even to the contempt of self. The earthly city glories in itself, the heavenly city glories in the Lord... In the one, the princes, and the nations it subdues, are ruled by the love of ruling; in the other, the princes and the subjects serve one another in love." Augustine died on August 28, 430, as the Vandals were besieging his own earthly city of Hippo. Can you imagine a Scottish pub placed in the desert where the temperature is a hundred degrees outside? Nor can I. The image of wool sweaters and kilts, darts, cool stout pumped out of a cold basement and pink ruddy faces on a gloomy wet day shrivels under the relentless hammer blast of the Central California sun. So, out of sheer desperation - knowing that my return to Scotland is unlikely, I have entered this virtual pub - where I can go and write, imagining that it is raining outside and that I ought to be wearing a heavy wool sweater. After an hour or two of writing, a couple of cold pints and a Guinness beef pie, I will walk back through damp and windy cobblestoned streets to century degree weather, fajitas and Corona light. I have named the pub after my patron saint: Augustine. Austin is the diminutive of Augustine. In fact, since our beloved saint's feast day is coming up in two days, we ought to honor him with a post and a pint then! 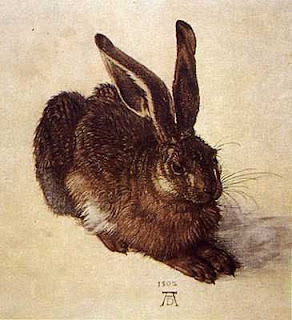 Two of my favorite drawings are by Albrecht Durer: the Little Owl and the Young Hare. 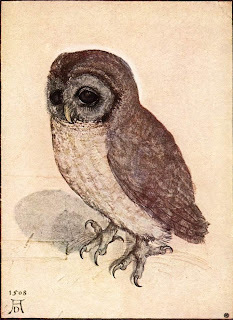 Many of Durer's etchings are Biblical illustrations and some drawings present dark apocalyptic themes but these two drawings - besides being beautifully rendered - are so peaceful and pleasant to look at: they are a vacation for my eyes. These are also two of my favorite animals. I think I could find in each of them an alter ego, two sides of the same person: one assertive, watchful and thoughtful and the other quiet, peaceful and lost in solitude . . . outside in the garden. 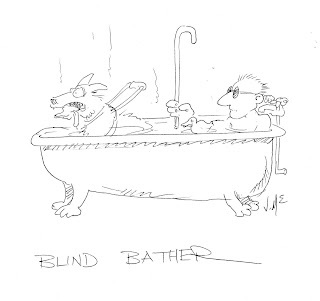 Once while driving down the freeway, I noticed a truck with a sign on it declaring "Blind Bather", which offered a phone number where you could reach this person. This begs several questions: (1) How is this blind bather able to drive a truck at 70 MPH - or at any speed without crashing? (2) Is this person bathing while he is driving? Is that why he needed that big truck to drive in - so there's room for the bath tub? (3) Why would anyone advertise the fact they bathe - no matter what their disability? (4) By the way, I am color blind. Should I print "Color Blind Bather" on my car? And if I did, who would care and why would they call me about it? Forget those questions about the Hegelian Dialetic, predestination and existentialism, I need to know the story behind blind bathers driving trucks!